Waters has a unique field-based Ecology and Environment program for grades K – 8. The Ecology Program is integrated with Waters’ Science Program. In Fall, Winter, and Spring, students participate in a nature-based field experience that focuses on education, restoration, and exploration. The students are introduced to nature in a way that fosters a personal connection to our natural areas. Volunteer parents and community members are active participants in the field visits, as well. Students keep field journals to write and draw about their experiences. Even the youngest students draw pictures or collect leaves for their journals. Students partake in 3 field-based trips per year to do hands on environmental stewardship and restoration work, and explore nature, in natural areas across Chicago. The field work starts in Kindergarden where students harvest potatoes, smell the mints and herbs, and are introduced to the wonderful community of creatures in the school compost bins. Our first graders take part in a year long study of the trees of Waters School which culminate in a Tree ID Olympics and completion of their own “Trees of Waters School” field guide. 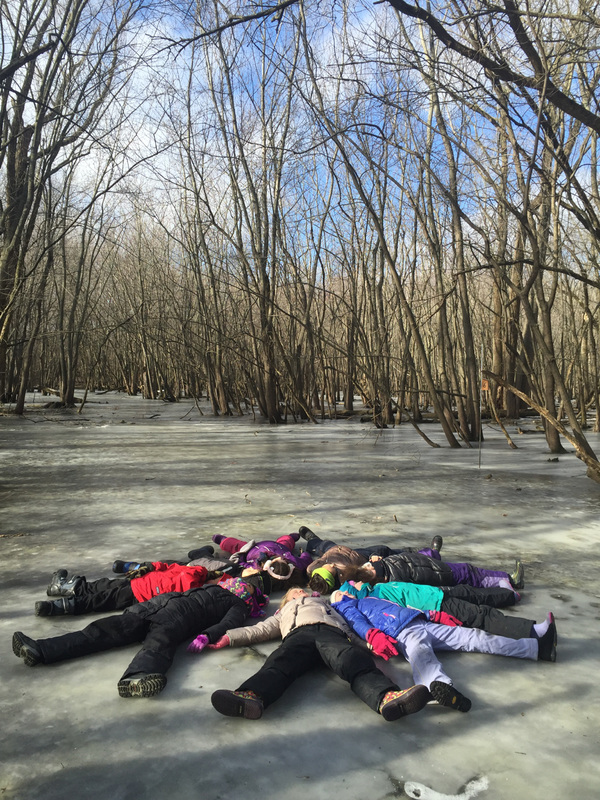 Second graders study the Chicago River in their first off-site field ecology experience. They visit the riverbank Between Montrose and berteau Streets, a site beautifully restored and managed by Waters School Ecology program and Riverbank Neighbors, a local stewardship group. Second grade studies the trees, plants, animals and benthic life and develope a relationship to this local natural area. Third through fifth graders are part of the region-wide Mighty Acorns program, whose vision is “to build an environmentally literate next generation that has the know-how and inspiration to take care of nature in their communities, resulting in a healthier planet.” They visit our adopted site, Sauganash Prairie Grove, through the seasons to study the ecology, explore, and perform invaluable stewardship work. Our partner in this 24 year old collaboration is the Forest preserve District of Cook County. In Sixth Grade our students return to the river to study the river system, its connection to the Lake, to our fresh and wastewater systems, and the complicated watershed we live in. They do chemical and biological tests to assess water quality, visit waste water and fresh water plants, and come to an understanding of the geography of the Chicago River system. Our partners in this effort are the Friends of the Chicago River. In seventh grade we focus on the Lake Michigan ecosystem and the nacsent dune in formation at Montrose Point. We study food webs and geology, glaciers and invasive species. The Lake is a giant mysterious wilderness within just a few minutes of our school. Our partners are the Friends of the Parks, and the Corinthian Yacht Club. Eighth grade returns to the garden for their ecology lessons, helping to maintain and improve our vast school gardens. They also harvest, prepare and eat our garden produce: mint teas, berries, fresh vegetables, garlic and herbs. They do woodworking and service projects including the building of new gardens, cold frames, benches and seating areas. We celebrate their imminent graduation with a pizza party prepared by students in our garden kitchen and pizza oven, with pizza sauce and juices grown and prepared by our students. Students play a major role in the recycling of classroom waste. There are two recycling captains in each classroom from 1-8th grade. The captains grade their classrooms efforts at recycling and empty the classroom bins. Twice a year we celebrate and discuss our efforts at Recycle captains luncheons. Recycling and leftover food from the Breakfast in Classrooms are collected daily for food share and recycling. Food and waste from the lunchroom cafeteria is sorted for recycling and composting of all food waste. Our students help maintain and distribute our school compost to re-invigorate our planting beds and to maintain soil fertility. Rainwater is collected from the Annex roof into two 500 gallon cisterns. Other rain barrels dark the gardens to collect our precious rainwater. Almost 100% of the rain water that falls on Waters School grounds is diverted from the sewer system and captured into the soils and gardens, helping to prevent flooding and sewer overflows into the Chicago River. We have a bank of solar panels on the south face of the main building producing 1.2 Kwatts of energy for the school. The Waters Garden is both a food garden and a native plant garden, with 300-plus year old Burr Oak trees. It is the home base for the Waters Ecology program and is also used as a research site by local scientists and conservationists. It is a natural playground for the students and a community gathering space for garden potlucks, drum circles, campfires, and more. It is cared for and maintained by students, parents, and many dedicated community volunteers.